Post here your 2NE1 announcements ( contests, poll, votes, anything you wanna share about the jjang 2NE1 ladies! – ANYTHING 2NE1 [ AS A GROUP ]. NO BASHING , SPAZZING ON PAIRINGS AND UNRELATED COMMENTS/TOPICS. NOTE: If posting a photo, just type the image URL, and we’ll do the rest. Dara on Reader’s Digest Asia! 2NE1’s Dara is our June cover. These are components that an officer is prone to notice in a report of the DUI arrest. Billboard has a fan army up for voting!
. i hear you need to vote in all categories for it to count? so vote wisely. we will be up against the other fandom who wins in their category as well.
. i hear you need to vote in all categories for it to count? so vote wisely coz we will be up against the other fandom who wind in their category as well. which contains plenty of useful data, thanks for providing such statistics. attempt you set to make any such excellent informative web site. I am subbing Dr. Ian… do share this out to the other blackjack!! missing you guys..keep it up! JUST WANT TO SAY I LOVE21girls. pls support 2ne1 and yg fam at MAMA 2014. they are up for best female group. even with the scandals and rumors of breakup, didnt they give us freaking awesome music? Lets support YGfam positively! hi… just want to share this… https://www.youtube.com/watch?v=oUx_WYq8exU. thank you admin and the many people who support this site. FIGHTING! I feel that is among the most vital info for me. And i am happy reading your article. this site as a best site for most up-to-date updates. 2ne1.. changed my life!! BLACKJACKS keep supporting them!! When is the arrived of 2ne1 in the philippines? I want to ask if there is a 2ne1 AON meet and greet in manila? Please answer. Thanks! Hello! We’re 2NE1 cover dance from Indonesia, 2NESTAR. Would you please kindly drop your like and comment in our cover dance video of 2NE1’s latest song, Comeback Home? We would highly appreciate that. Here’s the link of our video. [http://www.youtube.com/watch?v=QnDjO8DQ9XU&feature=youtu.be] Thank you so much! I want to ask if how can we get a chance to meet 2ne1 backstage during their AON concert here in Manila. My son and I are a big fan of 2ne1. I want my son to meet them in person. Please help us. My son always watch 2ne1 on youtube and he memorize all their songs. Since they started up to now. He’s birthday is coming on june. I want to surprise him as his birthday gift. Please help me. I’m begging. Thank you. Hi? BJPH where can i but their concert ticket? Want to express your current document is just as unexpected. The clarity in your post is just awesome we might presume you’re an expert in this subject matter. Effectively with all your choice let me to understand your Rss to help keep kept up to date using impending write-up. Thanks hundreds of plus make sure you continue on a satisfying function. I need help here. I am going to korea in apr and my date clashes with their world tour in Singapore. Since Im in Korea, I was hoping to get a glimpse of Dara at the airport. Do anyone of you here know where can i get their departure information? Calling all TRUE BLACKJACKS!!! !﻿ PLEASE Vote 2ne1 in World Music Awards for World’s Best Live Act & World’s Best Group for 2013!!!! It one click away!!! Its easy and would only take a few seconds to vote!! !﻿ Please vote everyday!!!! Spread the word please!!! just visit the World Music﻿ Awards site!!! This lets in oatmeal, weight misplace for Females1. up for the nice information you will have here on this post. hi blackjacks! hi ohdara admins! 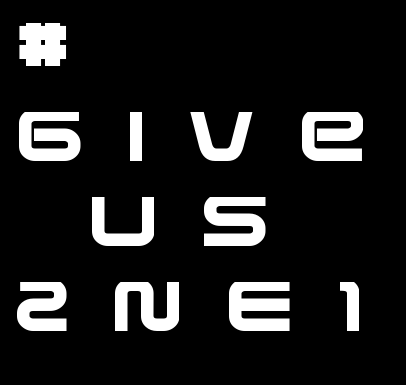 can you help us in trending #GIVEUS2NE1. i am not the one who started the idea but i thought i can share it with you guys. love this site..im checking this site everyday, ‘coz i know that it’s updated..hehehe..thanks!hwaiting!!! BLACKJACKS ALL OVER THE WORLD FIGHTING!! THNX FOR THIS SITE,, I GOT A LOT OF INFO AND UPDATE HERE,., WE LOVE U 2NE1!!! LETS SUPPORT THEM ALL THE WAY,.. KEEP IT UP! Hello, new black here, is there a way you can buy the sneaker that Dara designes? Epik High’s comeback & Lee Hayi’s solo debut this October.. so I guess we need to wait for another month again? *sigh* if 2NE1 can’t release an album thiis October that means they can’t attend MAMA2012 right? YG’s stressing me too much! super fan of 2ne1… how do i become a blackjack???? omg omg omg i love sandara park so much i proud being filipino becoz of her!! Lets us support 2ne1 this MAMA 2012..pls vote for them in the categories that they are nominated..pls. 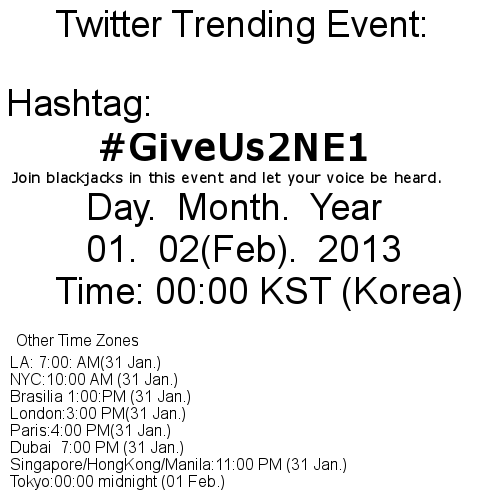 lets prove to all the people that BLACKJACK rocks! and 2ne1 is the best!..2ne1 ! 2ne1! GUYS! PLS. VOTE DARA UNNIE… I really want her to win in this poll. i know it’s mean but i don’t want to see her loosing especially to yoon a.
pls. help out and your one click is a very big help. It might be a rumor only but have u guys heard or seen the rumors circulating the net that Dara is dating Jaejoong ????? Wonder if it’s real or not but I kinda like the pairing though:)) lol hope nobody bash dara because of that dating rumor. wassup?!? ^_^ YG family is at Osaka! yesterday’s concert was a success~held a second performance at Kyocera Dome in Osaka today~! made beautiful memories with the seniors and YG family fans^0^ breathing the same air as 30 thousands audience! ^.^ awesome! TAG: YG family 15th anniversary concert Tokyo 21,22 Jan Saitama Super Arena! Blackjack, Let’s unite to create a petition To Mr. YG, for our Goddess Sandara Park to be﻿ featured in a Drama/Movie….. Her new Cf from Etude, proved that she deserved more than that. How can i erase this comment? hello~ blackjacks around the world ^.^ do u guys have facebook? If you do, please add me (Liina’s Oppa) ^.^ because I love blackjacks ;p keke~! Please vOte for 2NE1 plssss plssss…>! every one of us love 2NE1.. we all excited to see the lovely ladies wherever they are. we also like them for such a cool and true to us. we listen to their music, watch the MV’s even in youtubes, follow the 2ne1tv, i love my adidas now beause of them haha, and i also like nikkon now hahaha..
truly 2ne1 make us happy and make our day complete. i love them all but DARA is very esp. to me and to all filipinos out there. 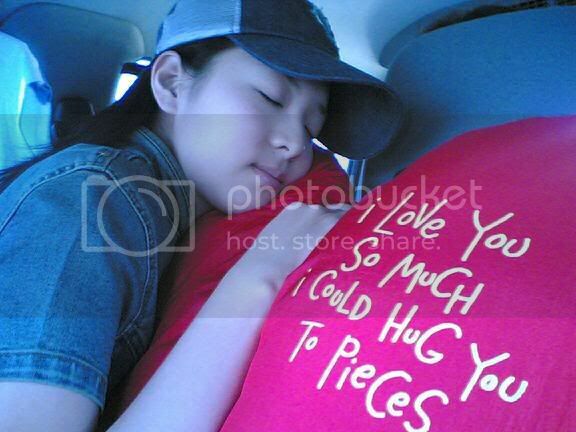 we seen dara before her debut in 2ne1. we know how kind hearted and down to earth person she is. we know that she also love our country. we miss our krung krung. Hey blackjacks~~~let’s vote for our girls 2ne1…they are the best…Please support them and vote them…go in this website find 2ne1 vs f(x) and vote our girls 2ne1!! !they are better than all the girls group~~~they should be more vote than f(x)! !><Please vote them!!! 2NE1 Lonely Cover Contest Final. Please vote for no.38.MightyNoona!! Thank you so much! ♥ http://t.co/vgYEJJe RT please! i love you sandara park ……. we filipinos are very proud of you…..sa mga blessings n nta2nggap m……. jas always be humble like u wer here in the phils….. Please vote for 2NE1 in MNET’s 20’s choice. It is now open for voting starting June 17 – July 6. The 2011 MNET Summer Break 20s﻿ Choice will be held on July 7 from 6-9PM KST. You can vote for each category ONCE PER DAY. Voting is open worldwide! NO log-in required. vote for 2ne1 and bigbang here!Q!!! can i ask…how to create an account here? waahh~i hope this is true..i cant wait!2ne1TV s3~lets watch it together blackjacks! and for the registration form its asking for alternating alpha characters and numbers? where exactly do i find that??? Just saw this: http://news.nate.com/view/20110416n03875 article about 2ne1 can someone help translate? Thanks! I’m so excited for May 15, 2011. @ne1 is coming.. I hope they havea long list for us. So we can make the most of it 🙂 Blackjacks! Are you ready? Let’s play 2ne1! maybe odara can post the links to all the contest (myx, etc.) where we need to vote for 2ne1 or dara on the home page’s margin. its difficult to backtrack and look for it. okiezz.. i’ll try that too..
instead of being with me putting a blank expression on your face. Am i obsessed? I’m sorry i didn’t mean to be that way but that’s how i feel she’ making you happy i could see that because your eyes never spark when your’e with me. I am the only one who stands like a fence on your way to happiness. Please don’t hate me. I’ll set you free in my cage called love I know it’s hard to let you go but as i saw you wearing a relief face i guess it hurts so bad but then you sincerely smile at me i feel content and happy i cried. Tears rolling down my face as i walked away from you.I caused you so much pain, again i’m sorry. You ghuyzz might get confused kekeke .It’s short so you ghuyz can arrange it and add some flavor into it ,it’s ok too..
the story is about a girl love a man that love another girl well of course she’s bound to get jealous but she realized their relationship won’t work that way so she let him go i mean she gets to understand the love between the man she love and the other girl i guess she learn to give way?They are in that relationship because of arghhh i can’t think of anything well all i can say is the guy is trap in that relationship…arghhh whatever that’s how i see it kekeke ok the mv would hmm i like to see the main girl seeing the guy talking on the phone with the guy truly love and he’ll start to cry awww that would probably hurt so much right? Let’s vote for 2NE1 at the upcoming MTV Daum Music Fest. Some may know, some may not: This isn’t an award show. It’s just that NETIZENS would choose the artists performing for it. 4. The page will refresh and that’s it, your vote has been registered. VOTE TOO FOR GD & TOP. They’re under the category ATTRACTIVE. You can vote for your other favorite artists too if you have, on the other categories. BLACKJACKS… please help me to win on Proud to be Blackjacks Contest ^_^ in philippines….. please click this link and “like” this entry… thank you!! Before TVXQ now KARA? it seems that a band will be successful in Japan they disband? I hope 2ne1 mwill stay forever!!! to all blackjacks and fans of Dara. vote everyday, choose dara in the category of : Best use in Social Media coz Dara is very good at it. thats one reason why we’re always updated about bigbang and 2ne1. just a random topic(not sure if it’s been posted)……………. mmm…. im still wondering why trinoma of all places.. there’s too much people there.. but i rember Dara saying he missed watching Harry potter in trinma.. haha..
guys i want to share this video from livelikeurdying.its dara and lee min ho with park bom and hyung joong. petition? yes go to YGL Woodara thread. I think they are messaging MBC, SBS, or KBS? i dont know.. But they are messaging them to consider dara and wooyoung.. ask them is when is the next because i think they are done messging them alrEADY..
2NE1 won the best female group in ALLKPOP! hey I was wondering if this statement was true. about Dara saying something about SNSD Jessica. Was this real or was this fake? 2ne1 funny mistake @ interview. hey guys watch this video..the baby is so fond of 2NE1, she’s the cutest fangirl. @ elshine26…….LOL…i saw it already and i find it so so funy……they’ve just prove there insicurities (hope i got the ryt spelng)…lol…..they’re a fan of WONDRGIRLz……..duh…..HEEDRAGON is been a decade and they better move on….lol at them……..itz really funny…they jst prove how low they are…and they still gving there best in makng that vid….so so funy…..
elshine26, maybe that hater is a big fan of one of those fanboys of Dara, afraid that she might lost all her chances in winning the heart of her idol to Dara.. that’s one of many reasons why Dara got lots of haters. if one fanboy have hundreds of fans, 1/8 are envious and jealous fans. can you just imagine if those fanboys have thousands of fans. it equals the number of Dara’s haters. since they cannot dictate their idols as if they owned them, they are turning their hatred to Dara. because they believe that they cannot level themselves up to harworking Dara, how much more her talent and beauty…got what i mean? haters will always be haters because they are selfish. so, no matter how hard Dara work, there’s always a criticism…why stoop down to their level? lets just support and pray for Dara no matter what. elshine26, if you cannot control anymore, why don’t you tell her to atleast try to be a trainee, or try auditioning to YG. Challenge her to show us her talent, if she has. and not making some stupid account against Dara. hahaha, now i’m starting to pissed off. PEACE on EARTH. guyz…plz post this or just check this out…. i just really want to know the address of yge ..anyone knows?? cathy i’ve asked already the address of yg entertainment building in S.korea before x’mas coz i want to send something for 2ne1, but i got no response. we’re asking again, anyone knows the address of yg, please. well i didn’t know someone’s asking for the address since i don’t have time reading all comments before. thanks deshi. happy new year..
who wants to go to korea to meet dara? i really want to see her!! /its already release on royalacesub but i cant find them there..? Dara wrote a message to GD and TOP. It’s in korean, hope anyone could translate it. Kim hyung jun making parody of Can’t nobody. I don’t know if this was shared already but at 1:04 is an epic scene – T.O.P, Dara & Bommie in 2010 YG Family Concert. They were singing Uhm Jung Hwa’s song that featured T.O.P. if im not mistaken jaejoong mentionef sandara park’s name twice.. starts from 3:10 – 3:28…. check this out… http://www.youtube.com/watch?feature=player_embedded&v=xeXsvsnj4uM#! did he really mention sandara?? he was actually asking for the young fans to raise their hands. hands in Korean is 손 (pronounced as son).. so i guess they raised their hands and that’s when he said 귀여워 (gwiyeowo) which is cute in Korean. is there anyway for me to download the mp3 of this cover for I don’t Care. It’s really good by Wheesung, Bobby Kim and Kim Bum Soo. Please please please help me! THANKS!! anyhow cant wait for gdtop comeback!! just wanna share this , interview of Dara live chat , i think this was last yr.
does anyone here knows the exact address of YG Entertainment Building in Korea? I want to send something for 2ne1 for christmas. Please. I like the site’s new look! there’s a link wherein an international fans can vote. choose 2ne1 then press “vote” – after that “you have just successfully voted” will appear. there’s a link in oh dara account. . im in Paris and i’d tried already. try it. for the love of 2NE1. lets prove to all competing artists that 2ne1 deserves all the awards they received in MAMA so once again, lets work hard together so that they will receive another 2 or 4 more awards in Golder Disk awards. TO ALL BLACKJACKS and OTHER FANS of 2NE1 NOT IDENTIFIED AS BLACKJACKS but simply loving Dara and other members: LETS ALL UNITE in voting 2NE1 in Golden Disk Award. lets prove to all competing artists that 2ne1 deserves all the awards they received in MAMA. so once again LETS ALL WORK HARD TOGETHER SO THAT THEY WILL RECEIVE AGAIN ANOTHER AWARD IN GOLDEN DISK AWARD. ..
i think i saw wonbin (dara’s ultimate crush) in mama..
is he the one of the mc’s? Wow! Blackjacks all over the world, our effort and love towards 2ne1 paid off coz we voted for them. 2ne1 Jjang!!!! OMG!! IM WATCHING MAMA AND THE PREVIEW SHOWS GODDESS D REHEARSING INAG WITH YB!! WAAAAAHHH!!! Can you tell me what is this all about I’m just curious heheeheh tnx!!! still no news of eng subs of 2ne1tv ep8 and 9? ?strong heart too?? dara is so pretty @ nonsanshi event, right?? VOTE 4 2NE1 & TAEYANG 4 THE 2010 GOLDEN DISK AWARDS . this is the part 2 🙂 Dara rap live! but short 😦 Bom’s You and I acapella! but short 😦 2ne1’s it hurts I LOVE DARA’s voice 🙂 And Go away ENJOY! Have you guys seen will.i.am wore on the american music awards, look at lego necklace and the other accesories, 2ne1 inspired?! Guys, did you know that Honey Lee (2007 Ms. Universe 3rd Runner-up) was originally to debut as a member of 2NE1!? is it really will air in GMA? pls do not stop voting for yg family in MaMa..especially 2ne1..for the music video…ga-in chasing so close behind 2ne1..
TWITTER TRENDING #2ne1tvneverend …WAY THE GO BLACKJACKS…!!! 2ne1 no.8 @ melon music award….wish we could vote…. 2ne1 album coming in the philippines………..
can you give me a link of strong heart where dara and bom appeared and 2ne tv ep 8 and 9 w/ eng sub??? is it out now??? thanks in advance…..i want to watch it badly!!!! already voted….tanx for da info dear……..
thank you for letting us know by the way!!! i voted but our goddess is still far behind…. i already vote twice with diff. email. by d way, until when is this.? still no eng sub for 2ne1 tv ep 8 & 9???? guys go watch this movie,with sandara ,with eng subs ^^ it’s super cute. yay 2NE1TV season 2 ep.1-3 were subbed already! check it out at official 2ne1 channel. YG is really GOOD! HE hears us. does any1 know how to vote for 2ne1 in 2010 melon awards? guys go vote for mama.our girls have to win ok ? ^^ keke.pls go vote everyday.gain surpassed 2ne1 in best music video.so go vote keke…it’s just a small gap.we can make it if blackjacks are all together keke. clap clap clap! ang ganda ni dara… superb! they need our vote too…till 15th,mid nite..
does it have a english version?? does any1 know about 2ne1 tv ep.8 eng sub? i mean,anybody translated it? #HappyKrungDaraDay on friday @ twitter! did you read the ANNOUNCEMENT at the main page of this site?? i need to vote sa mama, i did the login part and then? im going click the VOTE word, that’s it? how about i double clicking the vote sign? there’s no one pop-up saying you already vote like that? tnx… tanong lang me baka mali kasi sayang lang ang vote baka ma-deduct eh kkkk..
wee as of 9:30am today 2ne1 is the BEST FEMALE GROUP, BEST DANCE PERFORMANCE BY A FEMALE GROUP, BEST DIGITAL SINGLE (PARK BOM), BEST MUSIC VIDEO :)) weeee!! I read that too in All Kpop a while ago, so is that the final results? It seems Super Junior won the Song & Artist of the year thru the fans’ vote. I was hoping 2NE1 will win that category as well. 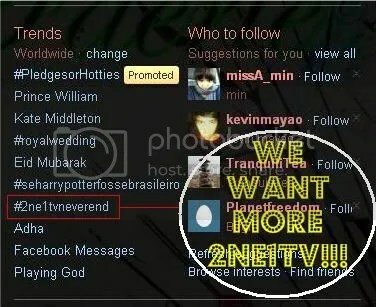 Let’s spread and help to request for Mnet a 2ne1TV extension! Do you know the official e-mail address of 2ne1? 🙂 Please! Thank you! errr, i think much better if you put this……. BJ ZONE is where we BJs can chat whatever that is related to 2NE1 right?? but we have to make sure that it’s related to 2ne1! and on the main page, every article, there are some who are spazzing, bashing and blah blah blah! do you gets what i mean?? errr, i know i’m just 1 of those commentors here, and i don’t really have the right to say this! it just that, i love this site and i love reading some comments here, but sometimes it’s kinda annoying reading some unrelated or some spazzing comments on the MAIN PAGE! sorry, for this super long demanding comment! tq so much for d link…yet,i really want to know or understand d 2nd part of d vid where lee seung gi ask dara about nickhun..where she mentioned something about philiphine and thailand, then wooyoung said something about it… any blackjack know what was all about? how do we vote for the 2010 golden disk award..??? no, 4minute is under universal. 2ne1 is the only korean girlgroup under AVEX. 4 minute, KARA, SNSD and Bigbang are under universal. don’t epect too much from AVEX’s statement or YG’s bec. AVEX also used ” bec. of their MASSIVE POPULARITY… blah blah blah” to 4MINUTE and now where is 4minute???????? i happen to read that eventhough 2ne1 did not debut at japan they are really popular. There is dis poll of who are the most popular girl groups in japan and 2ne1 got the third place. 1st-kara 2nd- SNSD 4th- 4 minute and 5th-T-ara.. There is also a poll who are the most popular member of a korean girl group. I forgot if bom is no.7 or no.8, dara either #10 or #11. Minzy and CL i think are at the top 20. 1st place goes to Go hara of Kara i think because she kinda resembles a famous japanese singer. I forgot the name but the singer is the one who is dancing in a coke zero commertial. 2nd is yoona of snsd. Tomorrow i will be posting the percentage criteria of MAMA AWARDS. got to sleep First,hehehehe…and vote for mama at melon awards and golden disk too. i dont know if they are attending melos but i think they are since last year they attended it. Lets vote!!!! 2ne1 fighting!!! VOTE!! FIGHT!! !WIN blackjacks!! minho would be the new mc for music core..
to those who want to vote and have problems…just use this website and select the english version. vote a lot blackjacks….10 accounts per pc is the limit so vote vote vote!!! the reason why it got only 1.3 million views is because the video was suspended for 8 months. eh really ..why did they suspended??? @dddd y ??? I’m actually kinda happy by this decision. This shows that AVEX is also after quality over quantity. Knowing that 2ne1 got an overwhelming response recently through the Tokyo-Seoul Concert. If I am a greedy company that handles them then I would release the album as soon as possible. So KUDOS to AVEX and YG for doing this, if this is really what they are thinking. Girl group sensation, 2NE1, amped up their Japanese fans with their plans to enter the Japanese music market. After announcing that they were signing under Avex Entertainment, fans waited patiently for further updates. “We have an announcement about 2NE1’s Japanese release. First of all, we received an overwhelming response after announcing 2NE1’s Japanese debut with us, so we would like to thank you for that. YG Entertainment Japan and Avex Entertainment have decided to delay the release of 2NE1’s Japanese album, originally scheduled for December 8th, in order to meet the high expectations. To be more specific, we wanted to make sure the content was absolutely satisfactory for their debut in Japan. Avex also advised fans to disregard any declarations made by “outside sites” about the album being “cancelled”. Could the girls be planning a completely new tracklist for their Japanese album? Or are they simply perfecting their Japanese interpretations for their previously-released tracks? Either way, we know that with the delay, the anticipation has just increased tenfold! *** THANKS to nana:) for the tip! So proud of these girls..hehehehe.. They havent debuted there yet but they are so popular in Japan. I love it…a really can smell their success when they debut in Japan. I dont have to worry at all. mary…i read it too….i just hope that their debut in japan will be greatly success like in korean and i hope avex will treat them nicely…kyak….i’m so happy for our unnie….hope she will be fine there…..
yeah…i get all giddy reading this article, so loving it…. i hope it will be a big hit. They already put the english sub !!! yay!! contact me thru email…i’ll make few accounts for u later..
can we post DARA’s promotion in abs-cbn..nah..sinong may nakaka-alam na website para malagay sa t.v. huhu..i just want them to win . whats wrong with mama??? i cant vote!!! the vote won’t appear in IE and mozilla…what to do?? Woah, I have the same problem here. It started yesterday but somehow I was able to vote on the last minute but now, I really can’t. i was told GDA is SM biased and Mama is YG biased…i dont know whats going on…BUT i’m voting everyday with 20 IDs using 2 PCs for 2ne1 in MaMa!!! blackjacks lets be fierce on voting in MaMa!!! fighting! from what i know, PAPA YG has a good relationship w/ MNET! JYP too! Guys, are we sure that our girls are going to attend at GDA? Coz if I’m mistaken, they have this NO SHOW, NO AWARD POLICY! Last year, they could’ve won the ROOKIE AWARD but PAPA YG didn’t let them attend the show! I think we should just concentrate on MAMA more! And also GDA is SM biased! So yeah..
GUYZ PLS HELP VOTE FOR 2NE1 HERE!!!! balckjacks: we need to work hard!beside MaMa, WE NEED TO VOTE FOR 2NE1 in gOLDEN dICS Award..they ssaid, the award is like grammy award..2ne1 must win!!! 2ne1 not on DIGITAL CATEGORY is pretty much a big joke which is pretty obvious cause 2ne1 has smashed digital downloads. really??? so we wont vote there??? have you seen links on 2ne1tv ep 8 w/ sub??? 2ne1 posted on WIRED.com. wow that is one of the more recognized technology magazine. wah T_T she is going to snub me from now on huhuhu. that will be sad. nice seeing you here in the blackhole. lol. im not active anymore @ that a site blog lol cuz its hard to read the other message ^_^ but always checking ohdara, a go go go blackjacks! finally…i’ve already finish voting for our girls 2ne1…. tnxs for ur help mikimeun….!!!! gtg guys! see you later, kya! sigh..i’m not really into this voting thingy…but peeps seemed to be going gaga over this…ok mikimeun..make me an account please…for the love of Dara…can’t believe I’m doing this…thanks in advance Mikimeun!!! oh sad its one id per one day vote. can somebody make me 10 accnts pls. so i can vote everyday. can you make me 5? pls. i want to vote again. i really wanna vote 😦 but i have a mac so no IE for me… T____T help! you can vote already, im using firefox upon voting, IE is only needed upon registering ^_^ fighting guys! hi guys! im from the philippines, whose willing to go to korea to find and meet dara. haha! im a big fans of her!! i tried making an account on 2010.mama.com but i received no verification in my email. how can i help support 2ne1? 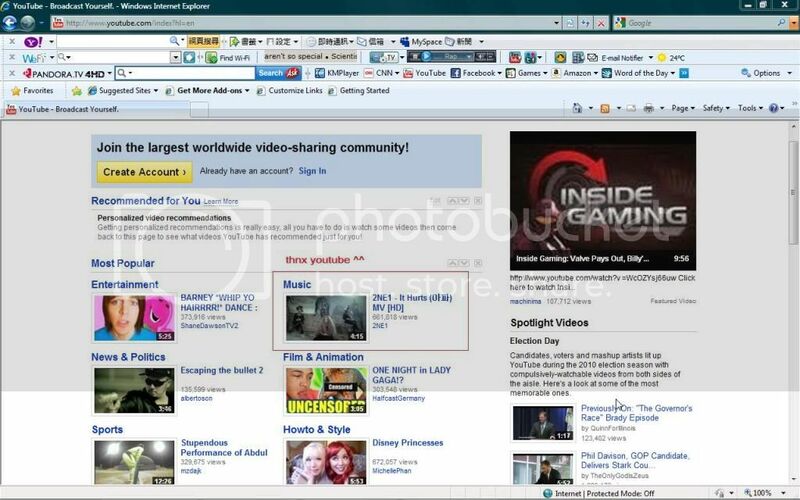 i am using IE now. i cant remember if I was using Mozilla when I did an account. is that why I got an error? hi, i want to help. how can i vote? you can only have 10 accounts per PC, since i’ve made 12 accounts, who wants to get the other 2??? here’s the id and password…vote for the yg family ok??? sorry for the id, cant think of anything else…..
reply if you got the accounts i post so there will be no confusions and i’ll be out first, so i’ll check this out later ok?? Have a nice day BJS!!! have you made an account??? i mean, were you able to make one or i should continue to make one?? ?sorry for the late repz…been busy lately. I used the shipper10 thanks darayah.. 2ne1 AJA! could you make one for me pls…. i really wanted to vote for our girls but i can’t make one, dunno y?… tnx alot…. oh… i Found it… hehehhe…. thank you so much for making it…. finally i can vote…. luv yah..!!! !blackjacks r a great family…. HELLO to all Dara fans! Like you guys, I’m also a die-hard Dara fan myself, sharing my love for this truly wonderful person. As I was browsing through YouTube, I came across a song by Cyndi Lauper called “True Colors”. I just realized how fitting this song would be for us Dara fans. As a request to the brilliant video editors we have here in this site, please find time to make a video compilation of some sort with the said song for its background music. I would be forever grateful if someone would have time to do so as I am not technologically blessed, myself. hahaha! my cousins do that to me all the time… they bully you when they feel comfortable around you hahaha! blackjacks..we need to double up our vote for 2ne1 in mama..their votes for song of the year and artist of the year so small..and their % to fight place with miss a so close..pls votes!! fighting!!! does it mean that all their song are in that album are translated into japanese? The next pop icon appears! “Outshining the power Lady Gaga x Rihanna- the next generation of pop icon,” saying this, anyone who likes music will be forced to notice. Singing rhymes with an edgy sound, unique fashion, makeup and hairstyles, 2NE1 sends out the image of young, lively women and expresses the message- that rather than attempting to flatter someone else, to enjoy your life for yourself. 2NE1 communicates this attitude through their songs and fashion; and focuses on issues that many young adults often face. The group name, 2NE1 mixes the number 21 with New Evolution, meaning “Evolution of the 21st Century”. There are four members: CL (Shi-e-ru), BOM (Bo-mu), DARA (Da-ra), MINZY (Min-ji). All of the members have background in the entertainment industry, either as working as actresses, dancers, and singers. Notably, even die-hard Western fans were mesmerized with their appearance at the 2010 Summer Sonic with Big Bang. With such high turnout, it seems the girls are an active, international phenomenon, led by YG Entertainment. As the group name suggests, their music style is pop, yet at the same time, it is superb, edgy, and exciting. Teddy is the sound producer of Big Bang’s “Let Me Hear Your Voice” and YG Entertainment’s main producer. He releases grime* and ragatekku*, a fusion of dance hall elements; electro; and R&B/hip-hop beats. He colors the four members’ cute vocals with autotune, allowing the girls the freedom to make “Pop Art” cool! Thanks to M.I.A.’s producer Diplo, known as Dr. Dore, even musical celebrities such as the Black Eyed Peas’ Will.I.Am have become captivated by 2NE1. Like their music, the synchronizing and advancing forms of street culture in 2NE1’s quirky, colorful fashion is a big attraction in Japan, and the girls are already leaders for fashionable teens. In comparison to Lady Gaga, Rihanna, Santigold, M.I.A., La Roux, 2NE1’s world is extremely cute. They are uniquely categorized in “Music & Fashion”, already praised as fashionistas of the world. Designer for Bjork, Madonna, Tegakeru, Jeremy Scott himself provided the original costumes for their album [promotions], which has garnered high interest. From Asia, the next generation of world-class pop icon will arise. 2NE1 is a prime candidate to do so. Written by Hayakawa Kanako with Avex. T/N: * referring to some style of music. oh my god…. this is soooo cool….. wayyyyy tooo cool…. YOU GO GIRLS… 2NE1… FIGHTING…. have you seen the covers of moamelody on our girls song??? so amazing and its a must watch covers…really! AHEM AHEM…LET ME HEAR YAH,, SAY HUWAT? jean…kyak….tans for posting it dear…kyak…happy…jumping..dance..
oh just finish watching….the tears of goddess is amazing even in 2ne1 TV she can make me teary eyed!!! i guess i have to much account huh?? many foreigner that following me get’s curious and watch the MV…ke ke..more thanks to them and also to all my friends in facebook who also compliment the MV..they also like it..
don’t forget to watch Strong Heart…ke ke ke.. I JUST WANT TO EXPRESS MY LOVE..
ayie…we love you tooo……..i think i just see you here…new in ohdara? usually boyband have more larger fanbase,so its natural for them to gain more vote..but don`t worry about that,the voting is just a small percentage in criteria..i`m sure 2ne1 will win…i hope. MAYBE. JUST MAYBE… SOME OF OUR FELLOW BLACKJACKS ARE HAVING A HARD TIME TO PENETRATE TO THE VOTING SITE..
2NE1… CAN’T NOBODY HOLD THEM DOWN…. thank you! then it’ll be another great night ahead hahaha! yeah, name says it all. So it was just the first time i’ve watched the “it hurts” mv and said to myself that 2ne1 really is good. then, i heard about them being nominated in some yearend awards (mama, i think) so after that very great mv, i told myself that i should vote for them so i went to 2010mama.com then tried to register but somehow can’t ’cause there seems to be a problem with my…password?? I dunno but this dialog box suddenly appears and seems to bring me back to the registration page (again)…so i was wondering if anyone here could help me out…? thanks in advance for the generous help! So when I enter the site…there’s still the english version…? everything else is in english, just that the dialog box after i click on “save” is written in an uncomprehensible language (i’m guessing it was korean but it just didn’t fully register, idk)…aww. Oh yeah, where’s my manners…umm, thanks very much for answering my queries! I think i’ll continue this on later, got to get some sleep though. Thanks for the info…ill keep them in my mind…hopefully ill be able to vote after my much-needed rest. Thanks again! that works for me, good luck ^_^ fighting! or i can post it here and you can change it later on? thank you for making one for me…. is it the ID already?? you could just give me d id and the password here… tnx….!!!! errrmmm…can any1 explain to me why by sudden people spazzing minzy and taemin?i know they share stage on inki but them as an item? sorry i know this is dara site..i’m just curious..
thats why i felt weird..coz i never came across any scene where taemin hints got crush on minzy…lots of fan made videos about them..i thought i missed something about them..
Sandara Park trending WORLDWIDE! Yahoo! Its another day guys so VOTE VOTE VOTE!!! we want the girls to win every category they’re in right??? WE want them to receive the DAESANG AWARDS!!! why can’t i vote again…I’m trying, but it only stays at the current rank. just continue …it would make difference but not right away it needs updating from the site..
i had 6 accounts already on that MAMA voting blah….come on blackjacks dont just say it…do it and vote for our girls…. they are way to far on song and artist of the year…..BLACKJACKS jjang!! …i just discover just a minute ago that we can vote many times even if u register the same email account in mama awards… just change ur I.D and password evertime u register.. i just voted 3x already with the same email account.. rily?? ?did you fill out the id number??? guys i can’t register to mnet. using explorer already. everytime i click save in the information part, a weird text appears and i’m redirected back to the same page. (had to enter the password again) and then i have to change my username too coz it become unavailable. what to do? weird..hmm..u hav to use explorer..and the username,yes u hav to change it…make sure u fill in all info…dont forget the authentic number..
i`m sure the mv will not release on time..maybe 2 hour late. so we’ll trend #2NE1ithurts NOW!!! hey blackjacks lets keep on voting for 2NE1, i made 3 accounts in mnet just to higher their votes..they are topping the best music video and best female category but they are close fight with Miss A in dance category,..and they are actually at the 3rd place in song and artist of the year!! blackjacks,,use your power~!! we can do this!! !2ne1 fighting~~!! i tried it but i cannot seem to penetrate it….were you able to join even if you in another country?? of course! its open to whole world dear…r u using explorer?u have to use it..firefox doesnt work..
is voting and joining at the site for free? guys do you have a video of dara and bom’s guesting at strong heart with english sub?please!!!!!!!!!!! me also looking for it here and there…god,i really want to know..
i can smell a little bit of daragon on AKP article about 2ne1’s teaser….. So the song/MV that they will release on the 31 is “It Hurts”.. The pic. so scary eh! I love the song! The Dancing Gods of the idol world gathered in one place! With every idol group’s representative, cool guy, and standing as the only female present, 2NE1’s Minji! what time is it? and can we watch this on live stream..? BAD NEWS..THE SUJU FAN’S ARE KEEPING UP MAKING 2NE1 TOP 3 FOR SONG OF THE YEAR AND ARTIST OF THE YEAR..GOSH THEY ARE FAST..KEEP VOTING BLACKJACKS..
I’m already done voting..and i’m really dissapointed at the current ranks…i mean come on!! !2PM is getting the first place for both Song Of The Year and Artists Of The Year !!!..what?.. common blackjacks!! !if your done voting today, vote tomorrow..and do whatever method like using your brother’s email to make an account or whatever,,,just make 2ne1 get the first place!!!! btw..it is free to register on mnet?? plz lets help our 2ne1 gurls to win. 2PM is winning right now for song of the year and artist of the year with 2NE1 ON SECOND PLACE! UPDATED! |101028\NEWS| MAMA: International Fans can vote too! 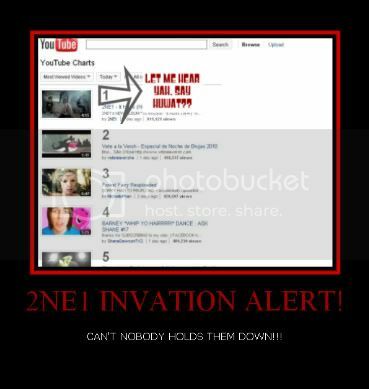 Hear that iBlackJacks? iBLACKJACKS can vote for 2NE1 too! 2. You have to vote for all the selections or categories to complete the vote. * If you already have an MNet account, enter your Username + Password (MUST HAVE letters + numbers). * If you haven’t registered, click “Join Mnet.com”. This will lead you to another window. 3. AGREE TO TERMS: Check all the check boxes then click “Save”. * Fill up the boxes accordingly. * To get your authentication number, you must be able to right click the certification. If not, then chances are you’re not using Internet Explorer. Switch to Internet Explorer and it will hopefully work. BUT click the certification tab ONLY ONCE. Also, don’t close the window! Wait for your authentication number (it’s fast). Check your inbox/spam folder in another tab/window. * If you were so excited that you clicked the certification tab a lot of times and received several authentication number, USE THE LATEST. * Enter the numbers you see in the image. 5. COMPLETION: Click “Log In”. You should be able to log in with the Username and Password you had entered earlier. tq to u..i hav registered..owh…and..since hav more than 1 email address, i registered twice at mnet..so i voted twice..i guess its a good trick to help 2ne1 win..hope others will do as such..lets vote for 2ne1..cant nobody hold us down!! u need to wait for few mnts.mine went to my spam. where can i find the aunthentic no.? My fellow blackjacks, 2NE1tv S2 ep. 6 english subbed is finally out. check the next part on the sidebar. maybe they are really going to debut in Japan early next year…They are not under Universal like bigbang, snsd,kara and 4 minute.. They are under AVEX like DBSK..
OMG! Theians dreams will come true now. Jaejoong and dara will be on the same company next year.. Maybe there will be a possible collaboration with them since they are dubbed Female DBSK in Japan!!! Yes!!!! if they were under AVEX, is they still under YG? yup….they were under avex at japan only..
guys….i don’t know how to feel about this..
guys check this out.. another news about dara at allkpop..
OMG! that is soo cute….”wah”! OMGah! I don’t know where else to post this but can somebody tell me what this is?! 2NE1 coming back on the 1st?! If it’s not about Love is Ouch it better be something from Will.i.am or DJ Poet ‘coz those beats are dope! Can’t wait to hear ’em. I’ve read somewhere that they’ll perform in Inkigayo this Sunday. They’ll release their follow-up song on the 30th, right? so maybe that’s what that update about. Will they start promoting again or something? If it’s a follow up then could it be from the album? I have this feeling that it’s a new song. They’ll surprise us, that’s what my brains telling me. I hope my brain’s right. kk. Is there 2NE1 tv S2 ep. 6 eng subbed already? Are there any streaming links for Strong Heart?!?! I wanna watch it so badly! No one hasn’t posted yet the strong heart vid…I think I’m gonna die!!! ****u know what i mean…..
yah..,i know what you mean..i like the chorus part of the “Hoot”, but when i look at their MV teaser, i kinda hate the “70’s retro” CONCEPT..i mean it’s kinda like “2 Different Tears” of Wonder Girls.., i don’t really know if the “2 Different Tears” of WG did ever make it on top but all i know is that it didn’t really make a huge impression compare to their Nobody…so i’m kinda thinking it maybe the same for SNSD…wat do yah think? SNSD is huge in korea u know…. They have a large fanbase so promoting against them is kinda hard but 2ne1 won against them last time. I dont care won against SNSD’s genie…. if 2ne1 choose to promote “Im busy”? i think they dont have a chance since most of the netizens dont like the song, they said that song has too much autotune. But if they promote “Love is Ouch” or a new mellow/upbeat song like i dont care? there will be a great oppurtunity that they will win against SNSD. i dont know too if 2 different tears did well.. I dont really like their “Nobody” song.. It’s just a simple song with simple choreography but catchy tune. They should promote Love is ouch or perhaps, a new song? Ü I don’t like “I’m busy” too coz yeah, TOO MUCH autotune. But I like it.. 😦 I don’t think it’s something they’d promote though. i have a feeling too that its a new song…. You have to watch stiis..its a fanmade MV of broken hearted girl 2ne1 cover..
kyakkkkk….so happy…lappy….they should rest now for the next 31st…. so happy!!!!!! congratz 2ne1!!!! congratz blackjacks!!!!! FTW!!!! ohh.., it blocked already..YG is fast…THEN TRY THIS ONE..
lol @ ‘Other girl groups beg guys to notice them yet 2ne1 tells them “I Don’t Care” and “Go Away.” 2ne1 a go go go! 2ne1Blackjack rocks! kekeke…yup, really agree with this news….. they really bring something new to a girl@woman……but emm…unnie, what u think about this “majority of 2ne1′s fans are from the 30 – 39 year old age group”? owh…..that why their album sales is really da bomb…..yg really catch that group taste…..
With 2NE1’s triple track promotion coming to an end, many have been anticipating their follow-up promotions. aisst…forget about this news…it’s not about 2ne1 but about beast…i just saw 2ne1 name so i assumed it was 2ne1 news. why is it only minji and dara in the picture? wow!!! look at 2ne1’s awards.. 2010 awards is not included: They are really super rookies..
-2ne1 already received 3 awards before they won their first mutizen. -Received their first mutizen 3 weeks prior to their debut, with only 5 performances beating SuJu’s “It’s You,” SHINee’s “Juliette” and 2PM’s “Hate You” with no album sales. -The first day of the release of their first album, it immediately skyrocketed to #1 in Hanteo, with over 50k pre-orders and sold over 80k in only 2 weeks. At the end of the year, they sold approximately 100k album sales. -All promoted songs, CF songs and solo singles peaked at #1, dominating various music charts. -Their second CF single, TTFM, went up to #1 in only a few hours and it did an all-kill up on music charts in 3 days with no prior notices, teasers, performances & etc. -Their first MV, Fire hit 2M views in just 1 day, making them the first rookie to enter the GomTV Hall of Fame. -Received their first “Daesang” award 6 months after their debut. Probably the only rookie to ever win a Daesang Award. -2ne1 already gained 25k of fans in their Daum fancafe before they even had their debut stage. i have a question why does dara’s single “kiss” not included on the song hall of fame??? is it not going well on the chart????? it’s about her hair, coz no one noticed that she dyed her hair! lol! 2NE1 with STAR DANCE SCHOOL!! hey admins, is it still possible to add videos for the b-day project? Well just in case, we could just send the link for the video. Since it was already uploaded @ YT. @2ne1shabam, The YCHL fanvid can do with it right? Hoping to see if the girls can get it. If we can’t sent it. We can just point the link to them to watch it on YT. i am cool with that too. hope they get that vid too. can anyone tell me why theres no 2ne1 on m countdown? theres no 2ne1 since last week i think on mcountdown, i guess even tomorrow they will not be in music bank too, maybe on music core they will be there…there preparing for their follow up song i guess. is there no mnet performance today? I just want to know. pls. can someine answer me? haha.. tnx so much..
tnx so much.. hope they will perform tomorrow on mubank. hope they will win too. im kinda thinking the follow up song is what WILL I AM produce..maybe all the follow up songs are in english and they will also release the Can’t Nobody English Version MV…don’t you think? I’m kinda confused about this follow up song! Our daddy yg said that it’s going to be release on 31st this month right? So is that mean a new song for our girls? Coz, their songs are released already, right? Also wonder if they’re going to released an MV for this follow up song! If it’s not a new song, hope they promote LOVE IS OUCH! hahahahaha… 2ne1’s go away is no.9 on dutch radion chart.. yehey!!! is it love is ouch, im busy and it hurts? im so excited!!! where can i see strong with 2ne1 dara and bom?? have u seen the preview? its blocked though, YG and Mnet is fast. OLD SONG VS NEW SONG! wow!!! so they are going to promote either love is ouch, im busy or it hurts? SNSD have so many fans already so going up against them is kinda scary…hehehehe…plus their songs are new… but, i wont underestimate the power of blackjacks too…GO!! FIGHT!!! WIN 2ne1…we will let 2ne1 rule again this november!!!.. so it means more music videos?hahahaha…yehey!!!! i read somewhere that david ki a.k.a ki sung yong tweeted and he mentioned DARA.——DO U KNOW WHO IS HE? its about the soccer player who posted sandara park is mine.. take a look.. dont know the primary link this is only re-posted but you can see pictures of their posts..
wow. their english songs sounds really good. OMG!!! Look at minzy’s shirt!!! BAGUIO!!! Wooaahh!!! Where’d she get that?? (Uhh Dara obviously!) ke ke ke!! NongShim will be holding a concert on the 14th of November at the Seoul Olympic Stadium for the 2010 Share the Love Concert. Nongshim along with Red Cross have sponsored this event and they will be celebrating their 11th year anniversary after they started this back in 2000. Share the Love Concert has been including Korea’s Top Singers annually for an audience of thousands all to share the love together for a good cause. This year will include 2pm, 2ne1, SHINee, Tiara, BoA, Miss A, Psy and others all including 15 artists in 1 concert. Also, Share the love concert on Nongcon’s official website has been holding quiz and asks for visitors comments for a raffle ticket event where they are giving away 2 tickets to each lucky winners. The winners will be announced on the 11th. Since 2000, NongShim have already donated over 433,000 packs of ramyeon’s to red cross. They will continue the good cause this year for another one big concert. Nongshim, one of Korea’s popular noodle brands, just announced that 2NE1 along with Shinee, Tiara, Boa, Miss A, 2PM and a host of other performaers will be attending the 11th Annual Share the Love Concert. The concert will be held on November 14th at the Olympic Park Stadium, with an expected audience of over 10,000. SBS is expected to air the show at a later date. This concert is Nongshim yearly “representative program” to celebrate the meaning of sharing love. It’s purpose is to get adolescents to think about the meaning behind sharing and to create a society where people will share with the underprivileged. Since its inception in 2000, the have donated over 433,000 packages of ramyeon to the Red Cross of Korea. http://player.vimeo.com/video/15920068101017 GA @ Inki from YGLadies on Vimeo. way to go YG! BEST EVA! how could be a girl in spite of the good looks be sweet at the same time?! tanx you so so much for the link…are you pinoy?? ?do you have any fan acc that really upload dara unnie during her philiphine days? ah…u r so lucky……..with eng subs??? i alwaz love this site. ii hope also that you will upload all the music video of sandara park in the phillipines. am really sure that youll gonna luv it. me too….i want it so badly…….all of dara unnie vid in philiphine, esp her SCQ days…. Yes! 2ne1 win their 4th mutizen inkigayo! let have major,major party party! lol… i hope they also win their 5th later. I really want to thank the people who make up OhDara for such a great site. I live in the US and don’t have any other source for Dara/2NE1 news except the net, and this is one site I always go to! You are all JJANG!!! Darlings/Blackjacks JJANG!!! omo omo that guy is so funny… certified dara fanboy hehehe…. wat did sandara said wen shes about to hug the guy??? need sub pls!!! i hope they show the preview of them in coming episode of strong heart. guys..hav u heard rumors that dara and nichhun dance together and he gav dara a rose…in strong heart..
god..gonna watch tis strong heart!! Then NickHun came to the guests, and the girl thought he was going to give it to Bommie, but was surprised when he handed the rose to Dara. Then Dara held NickHun’s rose, and he asked her to dance. ANd they got up and did a “couple” dance. Maybe slow dancing or sumn. dara seems to be uncomfortable because the writer said that she looked more enjoyable when she did her crazy dance earlier. hope it’s true. haha.. I think i just died when i read your comment. Can’t wait to see the episode. Shocks Im already dying of excitement. Darakhun? haha..
oh wow dont know what to say but it just makes me more eager to see strong heart subbed in eng… can’t wait so excited… thanks for the tip…. ohdara, you haven’t received any email from makiyo? ke ke…lol…yeah unnie..we jump jump jump 2gether…can’t nobody can’t nobody hold bj down…..
i read in allkpop forum,bom & cl will not be hosting mucore on sat, it replace by shinee, it sad though. .
2ne1 MNET VIP Interview @ YT is already on. I’ve seen caps of 2NE1 tv S2 ep4 that are already eng subbed…has anybody posted the link here?I’m really dying to see it…thanks! mikimeum……tanxs alot for your hard work…. hi, thanks. do u happen to know when 2ne1tv episode 5 will be shown today? Also is there someone video streaming it? thanks again. Hi. I just want to share this. It’s a poll which asks, I think, what song of 2ne1 do people like the most. Can’t Nobody and Go Away are tieing up for first place. so its really true that inki is cancelled? gosh.. hope they will broadcast it today even though how late it is. huhu.. If not, i will have to wait till thursday to see them perform again live. huhu..
May I ask where I could watch the live streaming of Inkigayo? Thanks for giving us the link of 2NE1 Win Win full Eng sub version. They already agreed that Dara is the one who will do best in variety show. CL even explain that even before guesting in the show Dara, among the four of them, is the only one preparing all the lines (well, with her TV host experience and acting when she was an actress in the Philippines do make sense in remembering all the lines). Se7en ask her if she wants to do variety show w/ him but YG won’t allow her, he thought she’s not good in talking. But Dara also explain that she’s not good in a reality show like “Family Outing”, she doesn’t talk unless she’s close to that person first then after getting to know that person she will be become a chatterbox. FO’s PD is even telling her to act cute with the oppa’s but since she’s not that close to them she pretended she didn’t read the sign & feels like going home, that explain why UEE got more screen time. Now, we know why she refused to participate in “We Got Married”. She prefer to become a TV talk show host, she was ask how she see herself 10 yrs from now, she wants to follow the step of Korean-singer/actress Uhm Jung Hwa, singing and acting at the same time. wow, tnx for this nice and clear review about winwin conversation.. i didn’t watch it yet.. True. It seems like she’s having self-confidence issues. I wonder what brought this about when I take her to be a really self-confident person. I mean she is acknowledge as the ace in her group. Isn’t this the reason she cried in episode two in 2ne1 tv that she felt she is bringing down the group? She seem suddenly sensitive about this when she had clearly proven to everyone that she has more to offer than just image. HOST: Who looks at male idols the most in 2Ne1? Bom: Dara! —- CL, MINKKI : Dara unnie!!! HOST: How’s Kikwang (BEAST) as a boyfriend? Dara: ———— Very cute, ommo! I think Kikwang’s cute too hehehe, but he’s too young..but still, a cutie! PLS. HELP 2ne1 ! Blackjacks, VIPS, etc. we can do this ! yeah still doing it over and over again… please support our girls… hope they will win this time… 2ne1 fighting….. Yeah!!! and pls include Soribada downloading & streaming!!!! here’s the link i found for win win with eng subs… http://www.dailymotion.com/video/xf4l9w_09-28-10-2ne1-on-win-win-eng-sub-1o_shortfilms have fun watching…. much love to 2NE1…. FIGHTING…. guys, any others link for win win eng subs?? Yeah, I was so confused too! I checked their awards, and yeah CN won 3x! So let’s keep streaming for GA! tmj, here’s the link, just listen to their songs till end then close it..and after a few min, open again, cann’t refresh it..
lol,i`m streaming for go away i thought CN won 3x already. it got me confused.,i hope they win tmrw. Guys, I read at LP21 that CN won at INKI just 2x, and GA 1, so let’s continue streaming! Let’s hope that they can win tomorrow! So that they can make a new record, wahh! Oh I mean, live performance …..
so you mean its true? beacuse you have oredered already? with a bonus song titled “F**k Y*U”? really? OMG!!!!! But why YG didnt say anything about this? its not listed @ the list, how come you can pre ordered? i even check the entry early from july, there’s none what is going on? someone gave me the link at kpopflash.net and at azstreaming.com. i was watching a while ago the live perf of cn and it was halfway through when a different music suddenly appeared… I hate them argh..
i was shocked too!! lol… they do that often ..haay tsk! KPOPFLASH is anti 2ne1! it’s better if we avoid that site! Everyone, PLS. HELP by listening to GO AWAY to support 2ne1! We can do this ! GO 2NE1 ! on my the win win subbed videos a re already blocked…plz admin give us another link plzzzzz!! !im begging…huhuhuhu….